A somewhat delayed posting of the play last Wednesday. We welcomed back Gordon and Steve P for the first time in a while and hope they will not remain strangers, we actually got to break even on the room hire. It's been a fair time since this was last on the table. Steve was able to get a good early lead by building a triple residence next to the street car line and was never in any danger after that. I just edged Steve P in the close battle for second place while Dave was a distant fifth having altruistically built City Hall and started the street car, to the benefit of the rest of us. 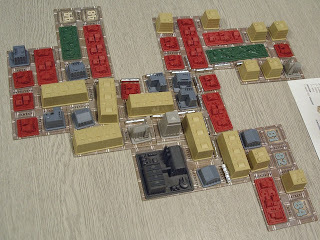 There was a general agreement that this is the sort of game that is probably better with fewer players, due to the loss of control due to the massive changes that can take place between turns. See attached picture. Next onto a game that I think is best with more players. A comfortable win for Gordon. I did try to stop him by trying an assassination on the last turn, but deciding that it was a choice between the King and the Warlord, I picked the wrong one. I was handicapped by only seeming to draw building of value 4 or more and only got 4 down by the end of the game. Oh Well. I had a great time thanks. 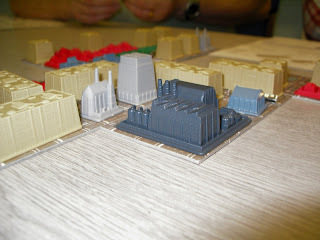 These were two slightly lighter games, both Big City and Citadels can work with gamers or with the family. I have been a bit off with Citadels in the past when played "seriously" preferring it played at the speed the kids race through it. Tonight it worked just fine, possibly me winning influenced my change of heart. As per Gordon's comment; I too think Citadels should be played quickly; some analysis pays off but a lot can be done during other players turns.